What do Britons Really Need? What if young people were taught about bearing the cross in crises and experiencing the power of prayer in difficulties? Children in the school can be educated about the parables of Jesus and his encounter with different human cases which put the highest human standards at the forefront. Sharing in God’s fatherhood, communal responsibility, social justice, unconditional forgiveness, sanctity of life and personal dignity are among the values that can encounter selfish individualism, undignified animalist life and radical ideologies. 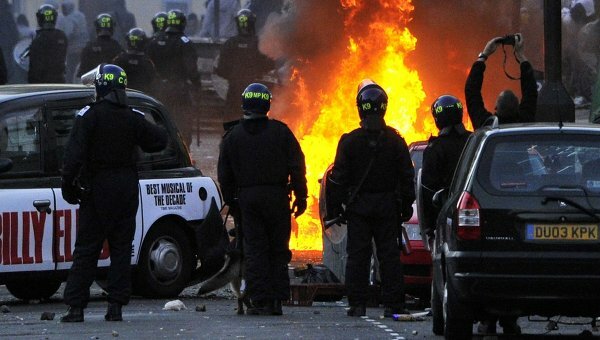 “Society is not just broken, it’s sick.” These were the strong words delivered by the UK Prime Minister, David Cameron, in reaction to the shocking riots that have hit several English cities, including London. I believe that this confession is the first positive step that was taken since the riots. Many tried to make up different reasons that sometimes, unfortunately, covered a sense of irresponsible justification of a purely mindless criminality spreading fears, even death, all around the country. Theories of conspiracies against the alleged marginalized layer within British society cannot face the bare fact Cameron referred to, that is the sickness of society. English streets have witnessed the symptoms of this sickness these last few days. These symptoms refer to a “moral problem”, as Cameron describes it; wrathful people wandering the streets at night, attacking shops, torching houses, shooting and robbing. Most of the rioters appear to be young teenagers but there are also a considerable number of adults, according to witnesses. Some of the investigated cases were of a good financial standing. A guy who works as a computer administrator and graphics designer was recorded by security cameras destroying and robbing a music records store. Cameron went on: “There are pockets of our society that are not only broken, but frankly sick. It is a complete lack of responsibility in parts of our society, people allowed to feel that the world owes them something.” The causes of this moral problem lie in the very heart of the culture of the English society. This society has been plagued by the different defects of modernity and postmodernity which drifted it away from its own identity and principles. Human beings cannot live without values and principles. When they lose their own values, an unguaranteed alternative fills the gaps in their conscience. The sociological implications of the enlightenment deism, followed by social Darwinism and eventually the dissolution of the sense of distinguishing between right and wrong in postmodernity consummated the wasted social awareness among people. The incarnation of this sociological shift is the aggressive behavior of people who lack the moral principles in favor of consumerism, or what is called now “shopping riots.” This consumerism is the term which explains the behavior based on “a shift away from values of community, spirituality, and integrity, and toward competition, materialism and disconnection,” says Madeline Levine, an American psychologist who is specialized in studying violent behavior. But what are these lost values? History can’t hide the fact that Christian values were held as the backbone of British culture and identity. When the enlightenment deism started its penetration into the British culture, since the late 17th century, a retreat of Christian identity happened under the fire of the alleged myth of scientism, as the Oxford science historian Allan Chapman calls it. Man became what he eats, as Feuerbach claimed. A retreat of Christianity took place in schools, public speech and in institutions, even the ones that bore the name of Jesus and saints. In 2008 Michael Nazir-Ali, the Bishop of Rochester, said that the decline of Christian values is destroying Britishness and has created a “moral vacuum.” He went on to claim that Britain “has been gripped by the doctrine of “endless self-indulgence” leading to the destruction of family life along with rising levels of drug abuse, drunkenness and mindless violence.” This moral vacuum can be filled with different trends according to the spectrum of human misbehavior, from instinctive aggressive behavior to radical ideological fanaticism. Britain has been witnessing all of these colours of devastating cultures from the “shopping riots” to London suicide bombings undertaken by Islamists. Yet Christian culture, which is arguably the heart of British civilization, is being publicly oppressed. Surpassing the expired argument that couples Christian culture with the institutional church to justify the attack on Christianity, let’s ask: What could the situation have been if people were educated about Jesus’ message? What if young people were taught about bearing the cross in crises and experiencing the power of prayer in difficulties? Children in the school can be educated about the parables of Jesus and his encounter with different human cases which put the highest human standards at the forefront. Sharing in God’s fatherhood, communal responsibility, social justice, unconditional forgiveness, sanctity of life and personal dignity are among the values that can encounter selfish individualism, undignified animalist life and radical ideologies. Instead of the failed rootless morality of mere co-existence, we can have the historically well-established values of the Man who embodied the Kingdom of God. The latter gathered the prostitute, the tax collector and all the marginalized on the very same table with God in order to transform the whole world, including its social structure. That’s why he was for them the real Lord Kyrios in the face of the Roman Kyrios who caused the existence of these marginalized social layers. I highly urge David Cameron, in his quest for “the root cause of this mindless selfishness,” to seriously engage with the appeals to undertake the proper measure to protect British identity and its Christian values in order to bring forth a healthier society for the United Kingdom. I’ve recently read an interesting explanation of the most famous English anthem Jerusalem. The author of the early 19th century poem, William Blake, implied a short visit of Jesus, in a famous English legend, would create a heaven in England, a Jerusalem instead of the “dark satanic mills” of the industrial revolution. Interesting, isn’t it? Minas Monir is a UK – based journalist, researcher and writer. The author of several published studies on Theology, he is also an expert on Egyptian affairs and political theology. He is currently an MA candidate at Cambridge Theological Federation and Research assistant at the London School of Economics.